Autumn brings silver grasses and golden leaves to a Devon garden that tumbles in terraces down the Blackdown Hills near the hamlet of Dalwood. To the south, just seven miles as the crow flies, lies the sea. Below, the gently undulating landscape of the Yarty Valley stretches eastwards as far as the eye can see. Wooded hills, grazed pastures and fertile fields are bounded by ancient hedgerows, a living reminder of the generations of farmers who have worked this land. 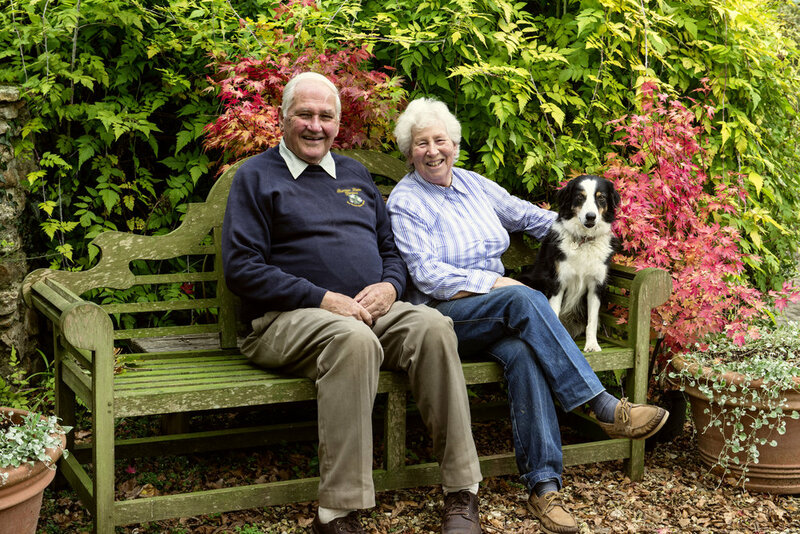 It is now more than half a century since Mary and John Benger settled at Burrow Farm and, bit by bit, turned the fields surrounding their farmhouse into a 10-acre garden and woodland. The hillside lies mostly on heavy clay, but John ran a dairy farm on the land, so there was no shortage of well-rotted manure to improve the soil. In the early days, all the pasture was needed to feed the cows. The only unused land was a derelict former Roman clay pit. “I was so desperate to create a garden that I started there,” recalls Mary. Slowly, with help from their four small children, she cleared the brambles in the old clay pit, revealing an ancient field maple. This still stands today in the Woodland Garden, a tranquil shady oasis filled with birdsong. Initially, there was no money to spare for planting, but some informal bartering with a local nurseryman resulted in milk being exchanged for plants. “After that I just kept planting, planting and planting,” she says. In the mid-1980s, John retired and the cows left. “For ages, I had been quietly stealing little bits of field to turn into garden, but now I had all the pasture to choose from,” says Mary. Since then, she has created new areas including a Terraced Garden, Millennium Garden and, five years ago, the Anniversary Grasses Garden. Each section is allowed to mature before work starts on the next. “The garden has evolved slowly, and a few years have always passed between establishing one area and designing a new one. This means each has a very distinct character,” she explains. Separating each area are mature oaks, maples, ash, magnolias, birches and cherries, that frame distant vistas, shrub borders and sweeping lawns. “Broad expanses of lawn are like a sorbet between courses, cleansing the palate before you encounter a different style of garden,” says Mary. The lawns not only separate, but also serve to bind the variety of styles together. They link naturalistic planting with formal, colour-themed areas, cottage style with rose pergola, woodland with herbaceous or terraces with courtyard. The grasses garden was created in a field on the farm’s westerly boundary, down the hillside from the house. The start of the path through the garden is flanked by the first of many clumps of Miscanthus sinensis grasses. These include variegated ‘Cosmopolitan’, and diminutive ‘Yakushima Dwarf’. Its pink-tinged spikelets grow to just 24in (60cm) high, turning silver with age. “Miscanthus are repeated along the borders’ length. They are the key to the design. Their height ensures that, once the first corner is turned, you cannot see out in any direction,” explains Mary. By chance, when she was planning the beds, a local nursery was closing down. She bought the entire stock of miscanthus for £200. She originally planned a mauve and pink colour scheme, but there are also some yellow nasturtiums that have spread far and wide. “When I first planted the borders, I wanted to echo the yellow of the buttercups in the neighbouring field, so I planted nasturtiums. They did so well I have been pulling them out ever since,’’ she says. The yellow flowers tumble onto the path as it narrows round the first corner, intermingling with foliage of Lathyrus tuberosus, a perennial sweet pea. Nearby is the first of many clumps of geranium ‘Rozanne’, a great favourite. “It’s so vigorous that it almost climbs up other plants,” marvels Mary. It is a wonderful filler that binds the planting together, as well as spilling into the path. This reinforces the seamless transition between path and border, created by an all-embracing mulch of wood chippings. When planning the borders, Mary first marked out the path that curves between them so that neither end is fully visible from the other. With the path being countersunk, any excavated top soil could be piled onto the borders each side to create gentle slopes for planting. “Then I laid the pots of ornamental grasses onto the soil, arranged according to height. This is so that the eventual effect will be graduated from path-side to back, with see-through grasses near the front edge,” she explains. Prior to planting, compost was added to each hole and every potted plant was soaked in water for a couple of hours. “After that, the borders were only watered as needed during dry spells, until well established,” she says. With its all-embracing mulch of wood chippings, the border is low maintenance. The only work is in late winter when that year’s flowerheads are cut back. To prevent the borders looking bare after this happens, several columnar evergreen Thuja occidentalis emerge as the path winds downhill. At this point, the border on the left side parts to reveal a wooden bench, edged in a low box hedge. “I like seats where you can sit and contemplate the plants. Otherwise, you just walk straight through, without pausing,” says Mary. From the bench, the tiered planting of the border opposite can be fully appreciated. It ranges from sedums, asters and hardy geranium, past clumps of Miscanthus sinensis and Verbena bonariensis, to the highest point where pampas grasses stand tall. Cortaderia selloana ‘Pumila’ is a great success, a compact variety with silky, silver-yellow plumes. To the right of the bench stands a clump of Deschampsia cespitosa ‘Goldtau’, a shimmering golden mass when caught in the evening light. Nearby are clumps of Verbena bonariensis and pink Aster amellus ‘Brilliant’, a magnet to tortoiseshell and peacock butterflies. “So many of the later flowering plants are rich in nectar,” adds Mary. There is also an unusually restrained, pink bistort. “Both bistort and sedum are grazed by the deer that wander in from the countryside,” she explains. Nowadays, when cutting back the previous year’s sedum heads, she leaves the long stalks to protect the new foliage from being eaten. With its blend of autumn-flowering perennials and ornamental grasses, this garden changes in mood according to the light. As dawn breaks above the distant hills and valleys of the Devon landscape, the grasses take on a cool silvery sheen. At sunset, they bask in a warm, golden glow, blending into the surrounding landscape with deceptive ease and great beauty. 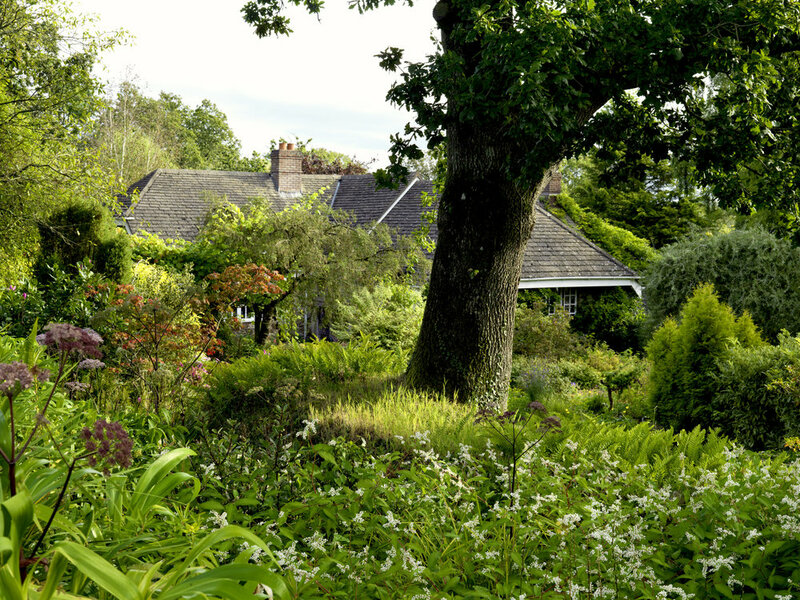 The full feature on the garden at Burrow Farm appeared in the Sept / Oct 2015 issue of LandScape.